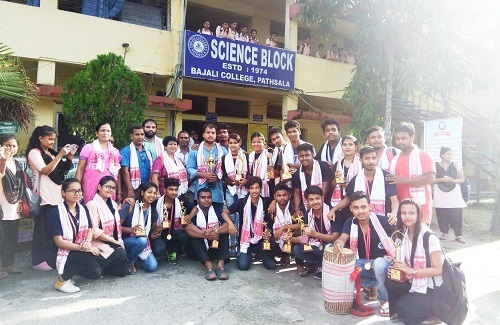 Bajali College, one of the premier higher educational institutions of Lower Assam, situated at Pathsala in Barpeta district, shone in the recently-concluded youth festival of Gauhati University. The students of the college were seen in joyous mode in the college campus at Pathsala on Wednesday for the splendid performances of the participants at the youth festival. The Bajali College team was adjudged as the second best team and first among 61 colleges of Assam under gauhati University. The Bajali College family accorded warm felicitation to the participants of the college on Wednesday. The participants joined various events and brought laurels to the college by winning fifteen medals. The team led by Rakesh Talukdar, General Secretary of the Bajali College Students’ Union, received six gold, 6 silver and three bronze medals. The victory was celebrated in the college premises by beating drum and performing dances with joy by the students. Dr Chandana Sarma, principal in-charge of the college expressed happiness at the success of the students. It may be mentioned that the college was adjudged the best college in the zonal level too. “The fifteen-member team received first prize in chorus, first in folk music (loka badya), first in mime, second in comedy drama, third in group folk dance, third in one act play, third in collage, second in photography competition, first in melody song, second in Jyoti Sangeet, second in Parvati Prasad Barua song, and second prize in Bhupendra Sangeet competition,” informed college sources. The team comprised Amlan, Dipjyoti, Chandan, Vikash, Abhijit, Dipankar, Krishan, Rajib, Satyajit, Kangkan, Manjit, pretom, Kousik, Manjit, Barasha, Rinkumani, Mouchumi, Jeuti, Manisha, Chayanika, Karishma, Pallavi, Bhagyashree, Nitu and Ankujyoti, Bipul Kakoti and Hirakjyoti Talukdar, a teacher of the college, guided the team.